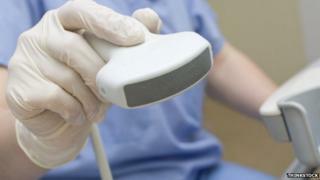 A blast of ultrasound can help stubborn chronic wounds heal more quickly, a study suggests. Tests on animals, published in the Journal of Investigative Dermatology, showed healing times could be cut by nearly a third. They become more common when we age due to a decline in our body's ability to repair itself. The high frequency sound waves physically vibrate cells in and around the wound. The process effectively wakes up the cells to make them more responsive to the wound. The report said ultrasound was "restoring healing rates to those observed in young healthy animals". Dr Mark Bass, one of the researchers from Sheffield University, told the BBC News website: "At the moment, treatment is based around stopping the infection and hoping it heals, with ultrasound we are promoting the healing of the wound." "It's activating the normal healing process, that's why it's an attractive therapy; the ultrasound is simply waking up cells to do what they do normally." "We're looking at 200,000 patients currently with a chronic wound, all those may well benefit from the technology," Dr Bass said. Dr John Connelly, from Queen Mary, University of London, said: "They're getting almost complete reversal of impaired wound healing which is quite impressive." "I think it could, but that's a major question as wound healing is quite different between humans and mice," he said. "One of the big wound-healing treatments is negative pressure - putting the wound under a vacuum - that acts through mechanical stimulation, so it's entirely reasonable that ultrasound may also work."